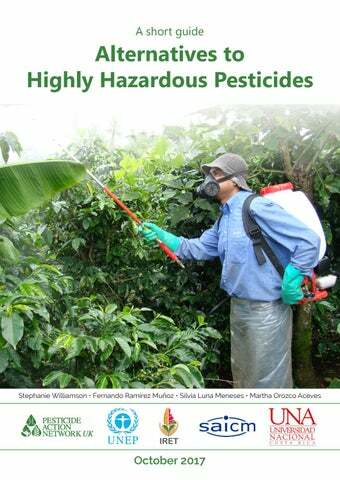 Authors Stephanie Williamson* Fernando Ramírez Muñoz** Silvia Luna Meneses** Martha Orozco Aceves** * Pesticide Action Network (PAN) UK ** Pesticides and Diagnostics area, IRET-UNA This document was written as part of the SAICM QSP project on ‘Highly Hazardous Pesticides phase out and alternatives in Costa Rica’. The project was kindly funded by the Quick Start Program of the Strategic Approach to International Chemicals Management and coordinated by the Regional Institute of Studies on Toxic Substances (IRET) at the National University of Costa Rica (UNA). PAN UK provided technical support and international liaison. IRET and PAN UK, 2017. Which pesticides qualify as HHPs? A definitive list of which pesticides qualify as HHPs has not yet been developed by FAO and WHO. However, UN agencies recognise the need to include not only the most acutely toxic pesticides but also those with chronic effects on human health, or those that are very persistent in the environment or in the tissues of organisms, including humans. There is agreement that pesticides listed in the Stockholm POP and Rotterdam PIC conventions and Montreal Protocol on ozone depletion should qualify, as well as pesticide active ingredients and formulations that have shown a high incidence of severe or irreversible adverse effects on human health or the environment. The Costa Rica project booklet on HHPs includes a detailed explanation of the HHP hazard criteria in the Central American context and the need for national action plans for reducing and eliminating HHPs.7 It lists 117 HHPs documented as used in Costa Rica during 2009-2015. For example, 23 pesticides in national use are suspected to disrupt hormone signalling; 21 are extremely or highly hazardous due to acute mammalian toxicity; 36 are classified as known or probable carcinogens; and 7 are reproductive toxins and/or damage genetic material (mutagens). For environmental hazards, 1 pesticide in use is bioaccumulative in animal tissues, 5 are very persistent in soil or water, 10 are very toxic to aquatic organisms; and 47 are highly toxic to bees. Disruption of beneficial organisms: Many pesticides (including some fungicides and herbicides) can harm the many different types of insect and other types of natural enemies (spiders, frogs, bats, birds) which prey on or parasitise crop pests. Natural pest control services have been estimated to save $13.6 billion per year in agricultural crops in the US.19 Pollinators and other beneficial organisms provide essential ecosystem services such as crop pollination and soil nutrient cycling -these are often overlooked but economically valuable for farmers and the longer-term productive potential of their land. Many wild pollinators and beneficial soil-dwelling microbes are very susceptible to pesticides, by direct contact or contamination of their food, shelter or nesting resources. Negative market consequences: Consumers and retailers are increasingly demanding safer and healthier food, with zero residues, or at least grown with much less use of pesticides. This has long applied for markets in developed countries, especially for fresh fruit and vegetables, but the same market trend is seen in developing countries, with more studies and media attention to disturbing levels of pesticide residues detected in food and beverage crops. Some economic costs of over-reliance on pesticide methods directly harm the farmer’s pocket: Pesticide resistance problems: Pests, diseases or weeds developing resistance to specific pesticides used against them continues to be a major problem, triggered by over-reliance on chemical control tactics. One notable current example is glyphosateresistant weeds in US and Canadian genetically-modified herbicide-tolerant crops (maize, soya, cotton) where high levels of glyphosate application for many seasons has provoked a crisis in weed management for many farmers, with control becoming ever more expensive.16,17 Another current crisis is in Indian and Pakistani cotton where excessive and badly managed insecticide regimes have led to hugely damaging whitefly outbreaks, partly associated with cultivating B.t. cotton cultivars that are very susceptible to sucking pests.18 Rather than focussing on rotating different chemical groups to try and delay resistance development, reducing reliance on pesticides and phasing in more Integrated Pest Management (IPM) methods is the best way to reduce the risks from and economic costs of hard-to-control pests. Phasing out HHPs means phasing in safer alternatives This section covers some practical, policy and farmer support considerations for people interested in replacing specific HHPs with alternative methods for managing the pest, disease or weeds targeted by the relevant pesticide. using a less toxic chemical or by a single nonchemical method. Switching to reliance on a single chemical substitute runs the same risk of the pest developing resistance (whitefly, for example, are notorious for their speed of resistance development), while a single non-chemical method may not be able to deliver as much control alone as the former HHP and farmers may be disappointed with the results. The first step, whether at policy level or by a cropping sector, food production company or farmer association, is to identify which HHPs are being used, in which crops and against which particular pest organism. It makes little sense to try and find generic alternatives to, for example, the HHP fungicide carbendazim in Costa Rica. The starting point needs to be pestand crop-specific, for example, alternatives to carbendazim use in coffee groves to control coffee rust disease. Simple substitutions with readily available alternative products can certainly be a quick and immediate first step, however, to be sustainable in the longer term, additional methods may be needed. Effective and long-lasting control strategies often combine a range of preventative and direct intervention methods â&#x20AC;&#x201C; this is the essence of Integrated Pest Management. Integrated Pest Management (IPM) is an approach that makes use of biological principles and ecological science, rather than the pesticide-dominant strategies which many farmers currently rely on. IPM covers not just insect pests, but also crop diseases, weeds and vertebrate pests (birds, rodents) where these cause problems. It is about managing these organisms to prevent them reaching levels where they cause economic damage, not trying to eliminate them. More information on IPM principles and practices can be found under Useful Resources. EXAMPLE: Integrating several methods to achieve effective pest control The case study on managing coffee berry borer without endosulfan (see section 3.1) highlights how all the farmers studied were using at least two IPM methods: in Colombia, these were intensified cultural controls (field hygiene); regular field monitoring; fortnightly berry picking; and some farmers applied biopesticides. In Central America, farmers undertook pre-harvest field sanitation of bored berries; postharvest removal of breeding sites; and employed trapping techniques or biopesticides. ecosystem approaches in pest management replacing endosulfan, recognising that pesticides are inherently hazardous and that there are better ways of managing pests. This involves rethinking the pest management strategy for the cropping system towards IPM principles and ecological methods. National governments are urged to support the HHP approach with progressive policies, such as banning or restricting specific HHPs, removing any hidden subsidies or financial incentives for pesticide use and actively promoting alternatives. The FAO/WHO Guidelines on HHPs emphasise that reducing reliance on pesticides is first priority in steps to reduce risks from HHPs, along with maximising non-chemical methods (Box A). Box A. Steps in pesticide risk reduction 1. Reduce reliance on pesticides. Determine to what extent current levels of pesticide use are actually needed and eliminate unjustified pesticide use. Make optimum use of non-chemical pest management practices in the context of sustainable intensification of crop production and integrated vector management (IVM). 2. Select pesticides with the lowest risk. If use of pesticides is deemed necessary, select products with the lowest risk to human health and the environment from the available registered products of those that are effective against the pest or disease. 3. Ensure proper use of the selected products for approved applications and in compliance with national regulations and international standards. promote substitution of HHPs by pest management approaches and products that pose less risk •	Consider using financial incentives (e.g. subsidy or taxation instruments) to favour low risk products, such as biological control agents and most biopesticides, over high risk products. Some countries are starting to take action on addressing HHP issues at regulatory level and/or via practical policy support for safer alternatives. EXAMPLE: Phasing out carbofuran use in Costa Rica In 2014, the government of Costa Rica decided to prohibit use of carbofuran, due to its high toxicity and potential risk to people exposed occupationally and to consumers via residues in food and the fact that carbofuran was one of the major causes of pesticide poisoning cases in the region.29 Carbofuranâ&#x20AC;&#x2122;s persistence in soil and water and environmental risk via run-off was also a factor in the decision and its high toxicity to mammals, birds, fish and aquatic organisms. The policy makers also assessed that for almost all crops, substitutes for carbofuran already existed, either other chemicals or non-chemical methods, with the exception of snail pests in pineapple and nematodes in banana. To enable producers of these important export crops time to find safer alternatives, a 23 month period of grace was given for use of granular carbofuran products in these two crops, under certain restrictions. ozone depletion). Several standards, plus some retailer companies, now actively address HHP issues in the latest versions of their individual pesticide policies, by prohibiting, restricting or monitoring specific HHPs. Table 2 summarises prohibitions and restrictions of three global standards certifying tropical export crops and one British fresh produce retail company in relation to different hazard criteria used in the PAN International HHP List. For HHPs on their restricted or monitored lists, organisations may require producers to: report on volumes used; take additional safety measures to reduce risk and exposure; request prior permission to use (giving justified reasoning); or take action on residue levels in food. EXAMPLE: Supporting coffee farmers to phase out endosulfan When Fairtrade prohibited endosulfan use by certified farmers (from 2005) and Rainforest Alliance and Utz Certified (from 2011), coffee growers using this HHP and their exporter companies faced considerable challenges to comply with the prohibition requirement. Several aim for medium term (3-5 years) phase out of priority HHPs currently in use, starting with developing farm or grower group plans for reducing use and phasing in safer alternatives. Success in phasing out HHPs is closely linked with support from supply chains in the form of training and advice for producers, rather than simply imposing compliance with requirements. Actively involving producers, researchers and others in trying out different IPM methods and developing effective IPM strategies for specific crops is very important. In Nicaragua, agronomists from Fairtrade coffee co-operative SOPPEXCA worked with 650 farmer smallholder members to trial trapping techniques for coffee berry borer, using ethanol attractant. In El Salvador, exporter Coex tested the trapping method firstly on its own estates and found the costs and effectiveness compared very favourably with chemical control. Coex agronomy team then promoted trapping and biopesticide use among its 2,000 supplier estates, enabling some to phase out endosulfan use within one season and to gain Rainforest certification for their coffee. Technical, economic and implementation information collected was synthesised into guidance documents on how farmers were putting the methods into practice and farm case studies. A set of videos illustrate farmersâ&#x20AC;&#x2122; experiences with cultural controls, biopesticides, trapping methods and pest monitoring and decision making.32 Table 3 summarises IPM methods used on the 22 farms visited. The Growing Coffee without Endosulfan project was conducted jointly by PAN UK and the Global Coffee Platform, with other ISEAL member standards, and funded by FAO, IDHâ&#x20AC;&#x2122;s Sustainable Coffee Program and ISEAL. It specifically aimed to document experiences of coffee growers in certified standards in replacing endosulfan use for coffee berry borer (CBB) Hypothenemus hampeii, an economically damaging pest which reduces quality and yield of coffee beans. The project interviewed farm owners and managers and agronomists in countries with (a) continuous flowering and harvesting (Colombia), and (b) defined flowering and one main harvest period (El Salvador and Nicaragua) to identify the different cultural, physical, biological and chemical controls reported in use, along with pest monitoring and decision-making tools. Farms ranged from 2 to 200ha, shaded and sun systems and five different certified standards, including organic. In Colombia, several of the farms visited are managing CBB very well almost without insecticides in areas where 10-12 years ago this pest was very problematic and many farmers were still using endosulfan. Successful IPM methods are being used by smallholders, medium scale farms and large estates, making use of research and extension advice from the National Coffee Growersâ&#x20AC;&#x2122; Federation (FNC). In Nicaragua and El Salvador, apart from the organic farms, several other farms are able to manage CBB without insecticides, or with much reduced use. There is increasing use of Beauveria biopesticides and of ethanol-baited traps. In all cases, either the producer co-op or the export association or other technical support provider is working closely with these farmers to promote these alternatives. Farmers are adapting some of the methods to suit their own situation, e.g. using empty soft drink containers to hold the ethanol attractant, rather than more expensive commercial traps, and increasing the number of traps set per hectare. (4) Some farms have greatly reduced or eliminated insecticide use for CBB: This is due to careful planning and organisation of IPM tasks, along with worker training and incentivisation, as much as the IPM methods themselves. cotton farms may apply three to five rounds of HHP insecticides, such as endosulfan, malathion and dimethoate, against bollworm. Insecticide use has been fairly common too among smallholder farmers, until falling cotton prices forced many to cut back on agrochemical inputs. Pesticide handling practices are very poor on large and small farms, lacking adequate protective equipment, and there are anecdotal reports of ill health among spray operators. (5) It is a myth that endosulfan alternatives are always more expensive: Trapping and use of Beauveria biopesticides can be cheaper than endosulfan application or similar in cost. Central American farmers using methanol traps found it much cheaper and less laborious than organising workers to spray insecticide - and far less risky to worker health. (6) Investing in IPM brings numerous benefits: None of the farms considered IPM methods to be too costly. Instead, they viewed labour costs of cultural controls and other IPM methods as a necessary investment to guarantee good coffee quality and which can deliver benefits including: higher price for coffee beans; expanded and more rewarding market options; improved farmer and worker welfare; wildlife protection and less environmental pollution. Safer IPM options exist for managing bollworm, including an innovative method for enhancing biological control by attracting predatory insects into cotton fields to feed on pests. First developed by entomologist Dr Robert Mensah in Australia 20 years ago to reduce hazardous insecticide use in large-scale cotton, the ‘food spray method’ has now been taken up by several thousand smallholders in Benin and Ethiopia. Food sprays are made from ground maize or waste brewers’ yeast, and attract predatory insects, such as ladybird beetles, lacewings and hoverflies, by mimicking the chemical cues they use to locate prey. These predators are important natural enemies of soft-bodied insect pests, such as aphids, and of bollworm eggs and very small larvae. Where these predators are numerous, cotton farmers can often avoid pest populations from reaching damaging levels or reduce the number of chemical applications needed to control them. Sprayed onto the cotton foliage early in the season, the odour plume from the food spray attracts these predators into the cotton rows so they are ‘ready and waiting’ before the first bollworms and other major pests arrive when the crop begins flowering. Farmers then need to monitor their cotton fields at least once a week, preferably twice, to check if they have a favourable balance of predators to pests present. Research experience from Australia and Africa has confirmed that if fields contain at least one arthropod natural enemy individual for every two pest individuals counted (a Predator: Pest ratio of 0.5 or higher), then small bollworms and other pests can usually be kept in check for the next few days. Further food sprays can be applied as needed, when pests start to outnumber natural enemies and tip the balance below this 0.5 ratio. Arba Minch Plant Health Clinic and extension experts from the regional Board of Agriculture. Trial results over four seasons proved that the food spray method could deliver successful pest control with yields similar or higher than conventional chemical control on large farms and much improved yields in smallholder farms. Net profits were also higher than current farm practice on large and small farms. Table 4 shows pest control treatments, yield and profit data for two FFS village demonstration sites and two large farms. Success in combining the food spray method with other cotton IPM methods has enabled over 2,000 farmers in Ethiopia’s southern Rift Valley to stop using endosulfan and other HHPs and change to a production system based on agroecological principles. Thanks to the set of IPM practices introduced via FFS training (e.g. optimum sowing density, methods for growing a healthy crop which can better withstand pest and disease attack, careful and timely weeding, good field hygiene), farmer groups have succeeded in increasing substantially the yields (Fig. 1) and income from their cotton and no longer risk exposure to harmful pesticides. Cotton lint from IPM trained farmers has been classed as top quality grade for two consecutive seasons and the combination of high quality with zero pesticide use is helping farmer groups to access new and more profitable market options, including organic buyers. The method also involves sowing 1-3 rows of sorghum or maize between every 8-10 rows of cotton. Bollworm female moths prefer to lay eggs on these plants at flowering stage than on cotton, so they serve as a ‘trap crop’ to lure this pest away from the cotton. The foliage also provides a refuge for natural enemies. For the food spray method to work well, broadspectrum insecticides which can kill the predators must be avoided, hence the need to use it as part of organic or IPM systems. Good results were also obtained in trial IPM plots on two large farms, with yields and net revenue significantly higher than those on the main fields under conventional chemical practice. At large scale, one or more direct IPM intervention methods are likely to be needed in addition to the food spray method and the project aims to experiment with light traps for bollworm adults and with a new botanical extract product for cotton pests. the soil and helps to inhibit weed development. Living mulches or cover crops: Selected ground cover plants can be sown between coffee rows for multiple benefits: soil protection, conservation of nutrients and water, biodiversity and natural control of pests and weeds. Suitable species should be lowgrowing with shallow rooting, which will not compete with the coffee bushes. Leguminous species are good as they can improve soil fertility too. Pesticide use surveys of coffee farmers in Costa Rica conducted under the HHP project identified several HHP herbicides in use, including diquat, glyphosate, oxyfluorfen and paraquat. Recently, more growers are using paraquat, raising concerns for worker health, especially if casual workers are engaged in poor practices. Paraquat is reported in use by 25% of coffee farmers surveyed during 20152016, spraying this acutely toxic substance from one to three times a year. Controlled grazing: Livestock (mainly sheep) are used by some coffee growers as a weed control method. Care needs to be taken to rotate their grazing around the different plots. Manual or mechanical control (by hand tools or motorised equipment): Coffee bushes are least able to compete with weeds in recently planted groves and in the period before harvesting. Manual weeding operations need to focus on (a) complete removal of weeds in the 75cm diameter â&#x20AC;&#x2DC;drip circleâ&#x20AC;&#x2122; around the bush stem and (b) selective weeding (hand pulling or slashing by machete) between rows. This practice is very important in the first two years. It also makes compost/ fertiliser application easier and reduces the number of weeding sessions needed throughout the year. Weed material removed can be left on the ground as a protective cover for the soil. Good cultural controls: Growing healthy coffee plants, with well-balanced fertilisation, helps vigorous growth in the early years, enabling the young bushes to compete better with weeds for space, light, nutrients and water. Planting at high density with improved varieties aids the coffee canopy to close quickly and limit aggressive weed growth. Modifying the weed community: This longer term method involves changing the composition of the weed communities, by leaving those plant species which provide more benefit than harm while eliminating those that are more harmful. It aims to encourage plants with a creeping growth habit, which donâ&#x20AC;&#x2122;t have deep roots and which quickly cover the soil. Illustrated guides to useful and harmful weeds are available. Use of shade trees: These help to reduce weed growth and the organic matter generated by leaf litter and pruning forms a mulch cover which further inhibits weeds. While coffee grown under full sun will need weeding 4-6 times per year, groves with shade trees need only 2-3 sessions. Timely control is very important - if weeding operations are carried out when vegetation is already thick and high, it becomes more difficult, takes longer and incurs more expense, whether this is done manually, mechanically or using herbicides. Pineapple production in Costa Rica can be prone to serious infestations of soil-dwelling nematode worms, which can damage the root system of young pineapple plants or open wounds which can allow attack by serious rot diseases. To avoid nematode problems, many pineapple farms rely on HHP nematicides ethoprophos or oxamyl, applied as granules to the soil just before, or shortly after, planting, followed by a second application, around 2-3 months later. Both these nematicides are extremely toxic to humans and known to harm non-target soil organisms. Ethoprophos is reported as one of the commonest causes of acute poisoning in Costa Rica and found to contaminate surface water and drinking supplies. Nematodes can be controlled without HHPs via: •	good cultural controls, e.g. careful soil preparation before planting to expose nematodes to sunlight, along with good crop rotations (continuous monoculture makes nematode problems worse) •	biological control, mainly via the use of products based on fungal species which feed on nematodes •	chemical control using new nematicide products which do not contain HHPs As part of the project on Phasing out HHPs, the IRET team decided to explore non-chemical alternatives to the commercial standard nematicide based on ethoprophos. A small pilot trial was conducted at a large farm belonging to pineapple company Fertinyc, in San Carlos district, Alajuela, in central Costa Rica. This company is keen to reduce pesticide and fertiliser applications and the farm manager has already experimented with biopesticide products based on the fungus Paecilomyces and succeeded in reducing HHP nematicide applications. Treatment costs: Contrary to widely held perceptions that alternatives to synthetic pesticides are always more expensive, all three non-chemical methods used in this trial were considerably cheaper than the HHP nematicide (Table 5). The cheapest treatment was for Klamic biopesticide based on Pochonia chlamydosporia. Costs were calculated for a single soil drench treatment although most pineapple growers usually make two applications. Key findings Nematode levels and plant weight: Numbers of pathogenic nematodes (Pratylenchus and Helicotlyenchus spp.) increased over the study period (Nov. 2015 to Feb. 2016), however there were no significant differences in nematode levels between any of the treatments. A likely reason was that the nematode populations in all the treatment plots turned out to be unusually low- well below the root damage threshold of 1,000 Pratylenchus nematodes per 10g roots. The trial fields were previously under grazing pasture and cassava, which may explain the very low nematode populations found, and none of the plots reached levels which would have justified treatment, either with synthetic nematicides or alternatives. The trial was terminated before fruit harvest (18-24 months after planting) so final yield could not be assessed. Nevertheless, measuring plant size at 75 days after planting, the team noticed that the smallest plants were those on the plots treated with the HHP nematicide and this difference was statistically significant. One explanation could be that ethoprophos was causing harmful effects not only to the target nematodes but to beneficial microorganisms in the soil, with adverse consequences for biomass production by the pineapple plants. HHP nematicides are very potent, with broad spectrum activity and known to cause damage to a wide range of non-target organisms living in the soil, including those that contribute to soil health, nutrient cycling and biological control of soil-dwelling pests and diseases. While not acutely toxic to humans, they are classified as chronic health hazards, including probable carcinogens, mutagenic, reproductive toxins or endocrine disruptors. Coffee rust disease, caused by the fungal pathogen Hemileia vastatrix, is an important disease of Arabica coffee and in recent years has reached outbreak levels in Central American countries, causing severe economic losses for many farmers. High infection levels can harm coffee through reduced photosynthesis and excessive leaf fall, leading to yield losses, and sometimes killing bushes. In Costa Rica, inappropriate and excessive use of fungicides to try and control the disease has increased coffee growers’ production costs and risks the development of fungicide resistance in the coffee leaf rust pathogen. Rust incidence percentage was assessed every month (Mar-Nov.2016) and severity on a five point scale in the last 3 months before harvest (Dec. 2016), using national sampling protocols. Key findings Disease levels and yield: At the commercial site, the treatment with the lowest disease incidence and severity was the non-HHP fungicide (T7), significantly different from the other treatments, with incidence remaining below 7% for the duration and severity under 1.05 out of 5. Among the treatments containing non-synthetic alternatives, the botanical extract combined with reduced rate non-HHP fungicide (T5) had the lowest disease levels, with incidence under 20% and severity below 1.33. + Although disease incidence and severity varied considerably between treatments at the commercial site, a different pattern emerged at harvest (Table 6). While the highest yield was obtained with the sulphur-calcium hydroxide mix alternated with Lecanicillium biofungicide (T3), yields did not differ significantly between any of the treatments. The treatments based solely on synthetic fungicides were the cheapest, with the HHP fungicide product a little cheaper than the non-HPP option. Amongst the treatments containing nonsynthetic alternatives, the cheapest were the mineral mixes alternating with Lecanicillium biofungicide, at almost identical cost. The project team observed that bushes at the commercial site in plots treated with biological products retained far more leaves and with a healthier, green colour than in plots treated with azole fungicides and hypothesise that the fungicides could be negatively affecting leaf retention. Key findings Replacing HHP fungicides with non-HHP synthetic products appears to be a feasible option, technically and economically. The trifloxystrobin + cyproconazole product produced the best results in terms of coffee rust levels at the site with low disease pressure, and at the high disease levels it was second best (before the trial was cut short). Its cost is a little higher than the HHP product but it could be a viable option for conventional coffee growers. Some fungicides are known to upset the balance between beneficial and harmful fungi and bacteria in coffee groves and may disrupt beneficial processes in the micro-ecosystem, aggravating rather than aiding disease control and plant health. The two treatments combining mineral mixtures with Lecanicillium biofungicide were the cheapest among non-chemical products and could be a good option for organic growers. The project work with conventional, IPM and organic growers has learnt of several good experiences with the tea tree oil extract, enabling users to reduce from four fungicide applications per season to just one or even a half dose. Some organic farms report good results with biofungicides when applied regularly (up to six sprays). For biofungicides to work best, background levels of the beneficial fungi need to build up over several seasons. The lack of any significant difference in yields between the treatments suggests that chemical and non-chemical alternatives to HHP fungicides can work to deliver decent yields, although the unscheduled addition of HHP fungicides to two of the non-chemical treatments probably contributed to the similar yields. As more regulatory agencies start to prohibit or restrict pesticides with specific HHP hazard criteria, more attention is focussing on alternatives, to feed into the policy process. 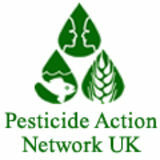 The definition of what constitutes an endocrine disrupting chemical (EDC) pesticide in the context of the European Unionâ&#x20AC;&#x2122;s pesticide authorisation regulation 1107/2009 remains controversial and contested, with agrochemical companies and some producer groups arguing loudly that banning widely used EDC pesticides will bring major economic losses to the farming sector. These arguments often fail to make a valid assessment of the benefits of reducing human or environmental harm or of the technical and economic feasibility of safer alternatives. References 1. 2. 3. 4. 5. 6. 7. 8. 9. 10. 11. 12. 13. 14. 15. 16. 17. 18. 19. 20. 21. 22. 23. 24. 25. 26. 27. 28. 29. 30. 31. 32. 33. 34. 35. 36. 37. 38. 39. 40. 41.